Last year I left a nice-looking plant growing next to my lamp post. It had big green leaves. 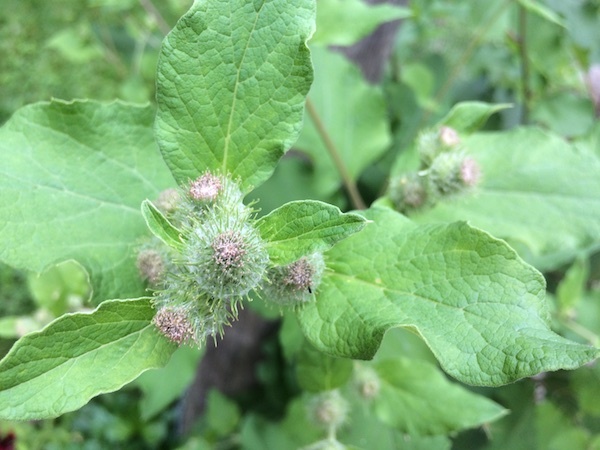 I tried looking it up, and my best guess was that it was Common Burdock. I even wrote about it in the personal stuff I put at the bottom of my materiamedica. This year, it came back. It kept getting bigger, and bigger, and bigger. Much bigger than last year. The leaves were as big as rhubarb leaves. And it kept growing higher, without blooming. Was I growing a jack-in-the-beanstalk type of plant? What was this incredibly large beast? Finally, I saw something that looked like a blossom starting. And so I looked closer. And saw this! Oh my. Those burrs! Sticky burrs. Sure enough, proof that the plant is Common Burdock, a biennial. So now I get to harvest its medicine. And I will be very sure to cut off all the burrs before they get to the point where they are ready to stick to my dogs’ fur! Kind-of pretty in an exotic, burr kind-of way, dontcha think?